The 400 range was Armstrong's first all-transistor series of amplifiers and tuners. Available roughly from 1967 to 1969. The units had a silver anodised front panel, with purple lettering, and a wooden case with a highlighted grill on the top. As with later ranges, the units were modular so the same amplifier and tuner circuits were used throughout the range. The photo above shows a front view of the 421 amplifier. The 400 range amplifier was, electrically, very similar to the later 500 range. Both the 400 and 500 ranges were modular with plug-in circuit board cards that fitted into a set of edge-connectors. Hence the 425 and 426 receivers (tuner-amplifiers) used the same amplifier boards as the 421. This modular system had the benefit that any sets that required servicing could usually be swiftly fixed by replacing a faulty board with a fresh one. As a result, a working unit could be returned to the owner within just a few days. It also meant that stock of the amplifier or tuner boards could be fitted into receivers as well as amplifiers and tuners, making production more flexible. Alas, in time, a weakness of this system was that the edge contacts of the boards are more prone to developing poor contacts than is the case for soldered joints. Hence it has meant that some 400 (and 500) range units now require occasional attention in this area. 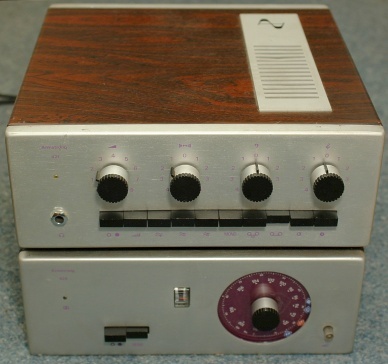 The photo on the left shows a 421 sitting on top of a 424 FM-only tuner. The tuning dial of the 424 shown here has had some diamond-shaped station identification stickers attached. These are visible near the edge of the bottom-right quadrant of the purple tuning dial. So the appearance here is not quite as the tuner would have originally appeared. When the 400 range was introduced in 1967, manufacture and sale of the 127, 127M, 227, and 227M continued for some time. Indeed, the (mono) 127M continued to be available for some time after the 400 range began to be replaced by the 500 range in 1968. Armstrong had high hopes for their first all-transistor range of units, but sadly they were less successful than hoped. This was partly due to the AL102 power transistors which were quite variable from one device to another, and were not always reliable. However the main problem was that the silver and purple styling (designed by Philip Connor Design Associates) was not to everyone's taste. The electronic and visual design won a Design Council award, but many prospective customers felt that the appearance would not fit into the decor of their living room. As a result, within a couple of years the 400 range was being replaced by the 500 which was much more attractively styled. Although electrically similar, the 500 range was to prove far more popular than the 400's. The picture above shows the 426 Receiver which combines an amplifier with an AM/FM tuner into one box. This monochrome image is scanned from one of the original publicity photos which Armstrong distributed to magazines and used in their advertising material. Colour photographs of the 400 range were not normally taken in the 1960's as all the magazines and the early publicity material tended to be in monochrome. The colour photos on this page were taken quite recently. Colour photos on this page © J. B. Lovelock.